This is classical game mode map, breezy mode is smaller and when you start at rank 1 the classical map, too. You play with three ships on classic mode and two on breezy mode. Every map has three cities of different colours. Every city is connected to one of the four goods (aspargus, bananas, rubies, and carrots) of the same colour. In the coloured area around each city only goods of that type will spawn. On the blue squares random goods will spawn. That´s important for two reasons. Cities won´t demand their own goods, so it´s better to spawn on the blue squares in the middle of the board and in every game there is one good, that is rare and generally more valueable, because one good has no city. Cities demand goods in two different ways. Every city offers a contract and you have to deliver three goods to fulfill it. With every contract, that you fulfill, this city will demand one more special good (the ones that you see on side of the map) in the future. In the first half of a game you should focus on fulfilling these contracts to increase demand (and to get gold on classic mode). In the second half of a game fulfilling contracts can be still good but delivering the most valueable goods gets more and more important. 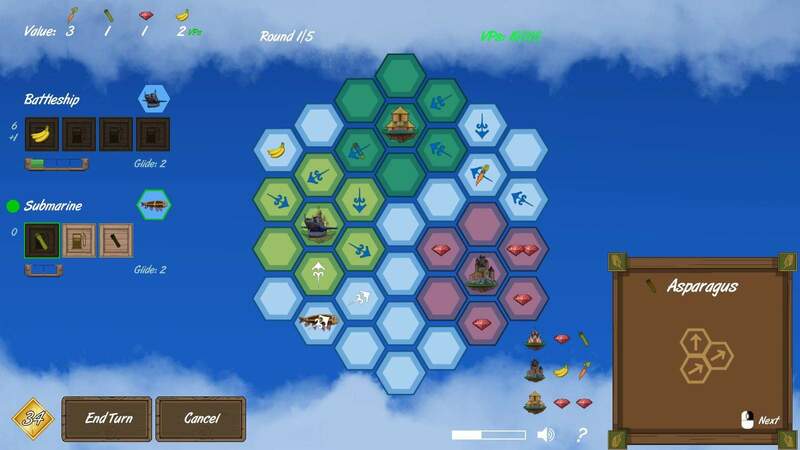 Goods and demand of goods are your power resources in SkyBoats. Ships can´t be improved much, you have to spam the map with goods to give them more power. If we look at our starting map, there aren´t much of them. A map should look more like this. You can gain goods in two ways: You can buy them at cities and every wind pattern that is played on a ship will create one good on that square. You want mobility of your ships and many goods to deliver. The strategy of the game should be easy. 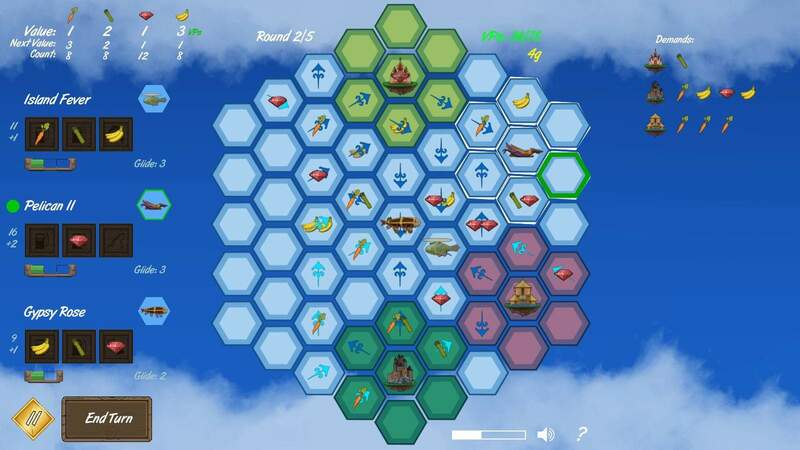 Centralize your ships and play wind patterns that affect more than one ship. This will put many many goods to the middle of the board. Take that seriously, because it´s the road to success in SkyBoats. It´s more effective on classic mode. 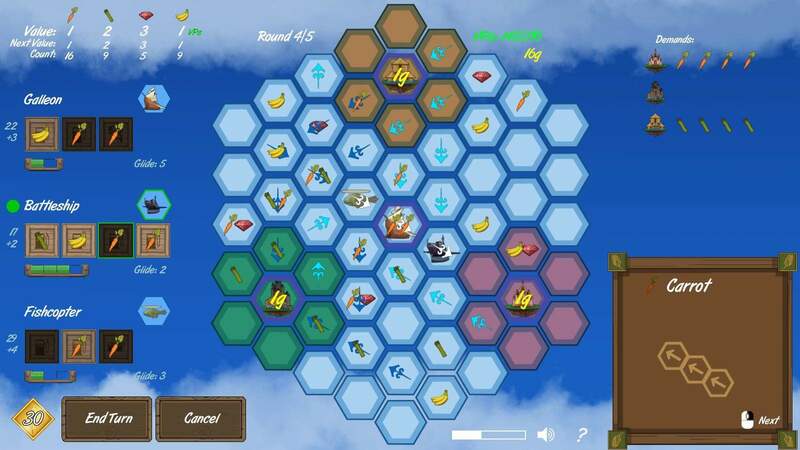 You have three ships and you get the additional advantage to move more than one ship to increase their wind meter. On breezy mode the map is smaller, centralization is still good, though and you should always search for moves like this (Dear Ruby). The submarine is hidden under some goods on that square below the battleship. Everytime you make such a move, you will gain one or two goods for free. This will make the difference. Learn to think of your ships as only one, they always have to move together and very often the order of your maneuvers will make a big difference. This is important, too. On breezy mode you can buy two goods of one type in every city per round. It cost´s 1VP. Use that, it´s very important. The goods will spawn everywhere, but the breezy map is smaller. In the second half of a game you might like to forgo, if you have allready very much of that type. The good will be rerolled on the next turn. On classic mode it´s more difficult. You pay 2 gold for two goods and can repeat the action with a new good after that. First you have to look at your money. You always want to have three gold to buy the next contract and refueling is very important on classic mode.If you have enough money, you should take a look at the market prices. The speedboat is at the green city and can buy two rubies there. We have a lot of money. Generally we would like to buy goods. At the moment there are seven rubies and seven bananas. Rubies will sell for 2g in the next turn. If we get new ones, they will drop to 1g. There´s a lot of demand for rubies and our fishcopter has two of them. So we should probably deny to buy. If you have centralized your ships and have plenty of goods on the board, you should watch out for demand. What are the best places to go? In the first half of a game contracts are a priority and you should always try to deliver one contract in turn one, after you have centralized your ships and have produced some goods. You need some money/VP´s to buy goods and fuel (classic). The most difficult decisions are, if you should sell 1VP goods, You might like so sell such goods to get new demanded goods. With a high wind meter on classic mode you can sell everything. On breezy mode you like to wait, until you sell cheap goods, as prices are randomized every turn. But freeing new demand can be more important, if the board is allready flooded with goods. Often the situation with the rare good influences the decision. If you have allready a lot of demand for this rare good and you can´t deliver, selling the cheap goods gets unattractive because you might get another demand for that rare good after that. And never sell rare goods for 1VP. You still need them for contracts. On breezy mode you might hesitate, before you sell the rare goods as a contract, because cities demand three of a kind. But they don´t will be rerolled, and if you have enough of them and they only sell for 1VP, you should take the contract. 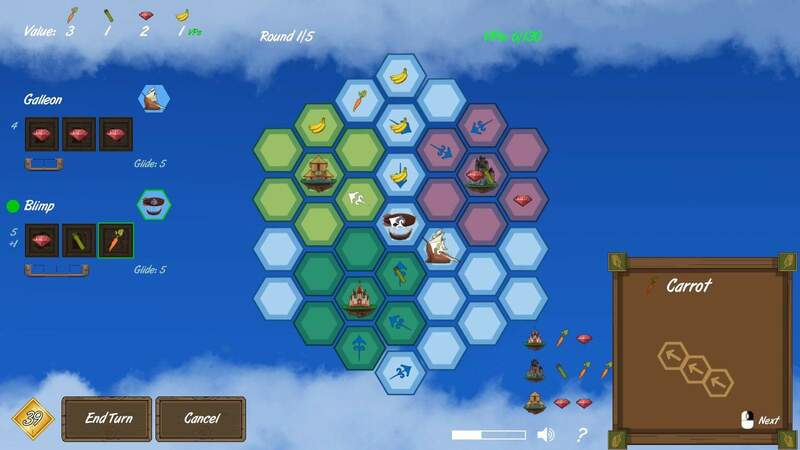 Creating wind patterns and goods and moving your ships is the key to the game. You can also use your cargo holds for other abilities. Nearly for all of them sometimes there will be a good moment to use them, but not very often. Breezy mode and classic mode are different again. On classic mode you have to pay gold for upgrading your ship. But you need all your money to buy goods and for refueling - and creating wind patters is too important on classic mode. A few upgrades are very good. A new cargo hold is very powerful, but very expensive. Increasing fuel and compass are good, too, but you nearly never have the money. A glide 5 upgrade for a glide 2 ship might be worth the investment, though. I would always think about getting it. At the end of a classic game you often have some money, but the upgrades don´t pay out anymore and mostly I still prefer to buy goods or have some money in reserve for a big turn with a lot of refueling. On breezy mode you get two free upgrades per turn in two cities. Always get them, but be still careful to use them. For many of them the smaller map of breezy mode makes them even less adorable. But you want to cycle them to get the good ones. Always think about, that your ships have different abilties and while it is important to play with them together and often keep them at a low distance, some can take more actions than others. Some ships might reach a better wind meter than others (classic mode) and you can specialize some in fulfilling contracts, while other ships deliver single goods with a high reward (classic mode). But I wouldn´t plan that at the beginning of a game. Even glide 2 ships can get a very good wind meter, because they will be moved very often with the centralizing strategy. Nearly everything that´s important, has been said. On classic mode every good can only be used one time to create wind patterns. After that you can only put this good into a used hold. On breezy mode a single good can be used multiple times, if you cycle it to different holds.This makes breezy mode a bit easier. You should be careful,if you´re selling a contract on classic mode, if these goods are stored in unused holds. Sometimes it´s better to use one of your goods, before you sell it. The biggest change of breezy mode is, that you can move out of ports/cities without using fuel. 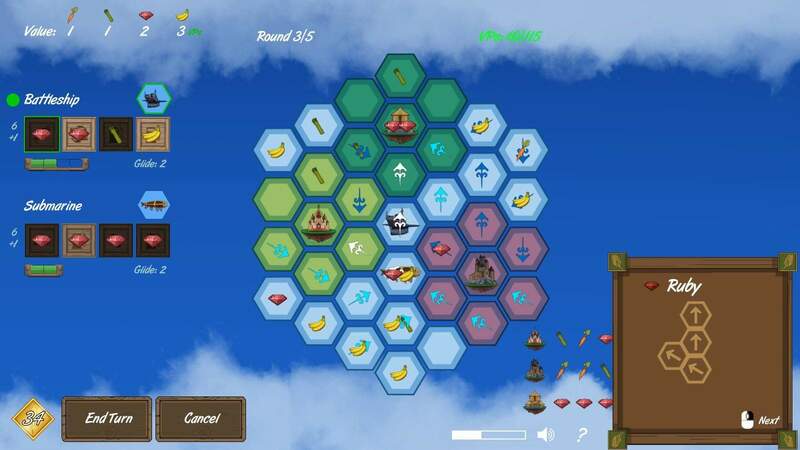 Your ships get refueled at the beginning of the turn for free. 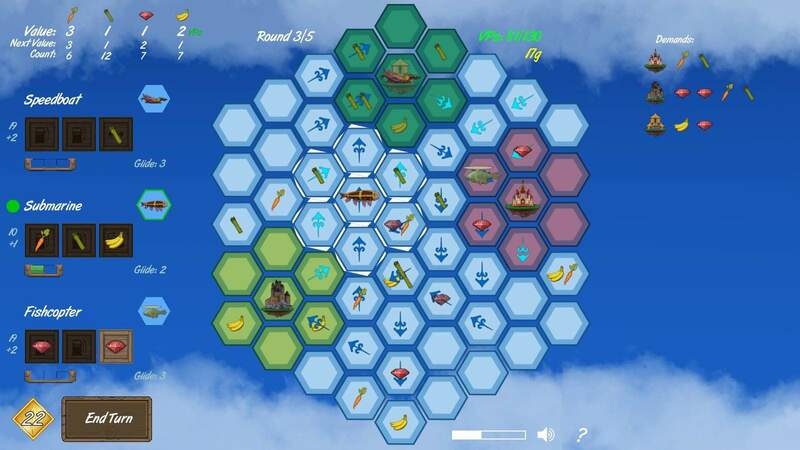 This might seem easier, but it creates new possibilities of moving your ships and more potential for skillful play. Moving around ports is very different to classic mode. This is a typical move at the beginning of a game and one you should never make on classic mode. Moving into cities is nearly always good on breezy mode, as you can move out of it for free. The speedboat makes a typical breezy mode move. It creates a wind pattern to move into the city. 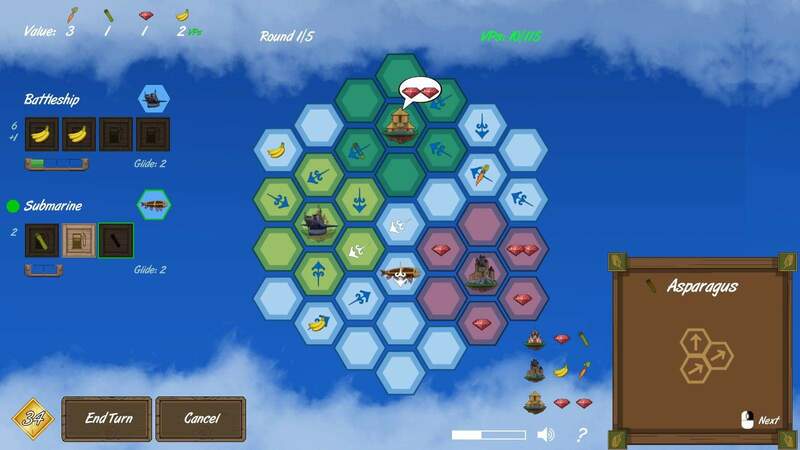 On classic mode you would move immediately to the middle of the board. The speedboat has a carrot, a second carrot is near the city and the banana city offers a contract for carrots. Moving the submarine one space to the south will bring it to a better position (connection to a city) and it creates a posibility for a two ship wind pattern again. The battleship moves southeast.The wind pattern will create a two square loop around the banana city. 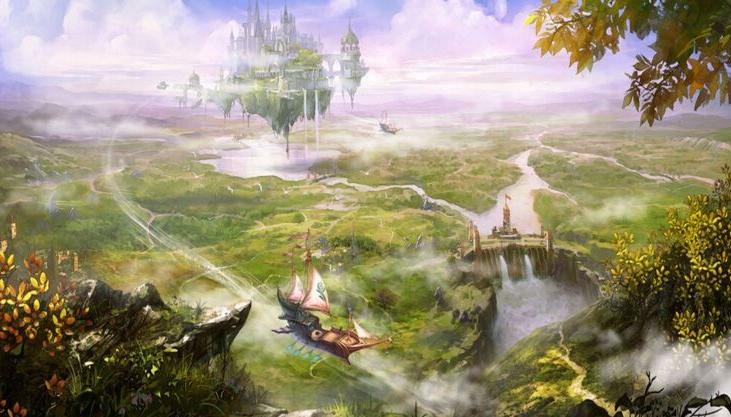 These can be especially important at the beginning of a turn, because you can increase your wind meter for free, if you move there several times. You always want to sell your goods with the +1 bonus of your wind meter on breezy mode. Here the battleship has that allready, but often it's worth to create such a loop at the beginning of a turn, especially if there are allready goods on that squares. 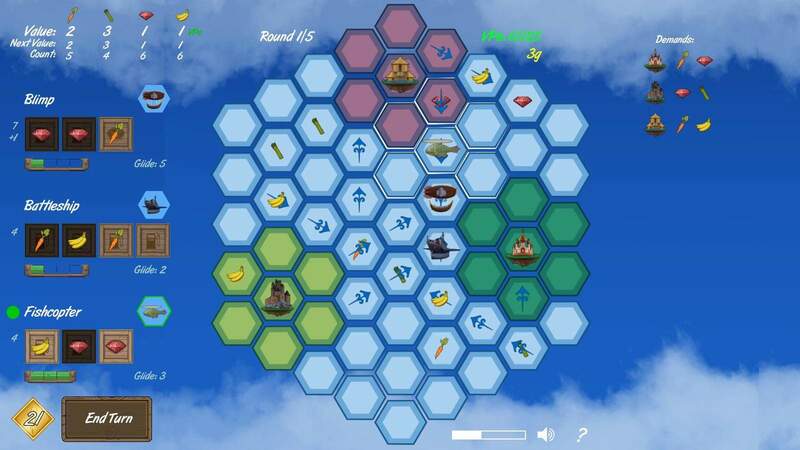 A major strategy of breezy mode is creating a wind network, that creates a big loop around the map. Your ships can move forever then. They won´t reach every square, but have big freedom to move all the goods as you wish. You can sell the valueable ones and store the others for better times at cities,if you like. You need at least one glide 3 ship for that. With a glide 5 ship you have more freedom and often get some better possibilities to combine your buildi up of the loops with effective creation of goods. Always look out for the glide 5 upgrade. If you have only glide 2 ships, you have to play more like a classic game. 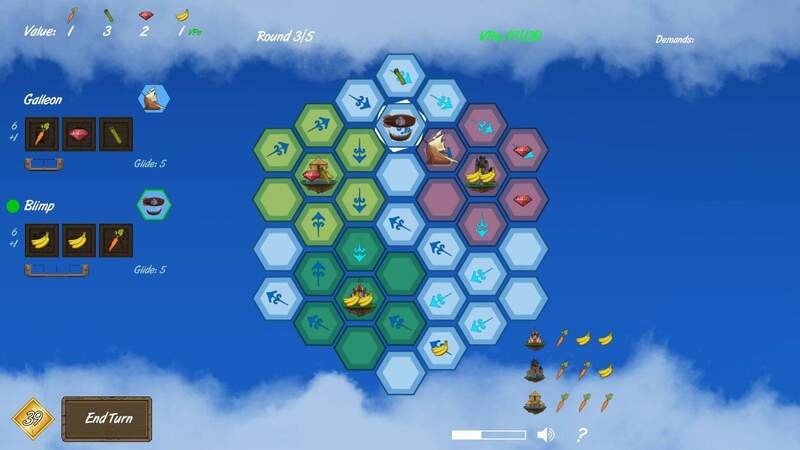 Centralize your ships and focus on spamming goods. That should be strong enough on breezy mode, too and glide 5 ships will also like these moves. With the loop strategy you will create less goods, but you can often exploit the whole map and use most of the goods, that are there. I think players, who start the game playing on breezy mode, can have a big problem with classic mode. 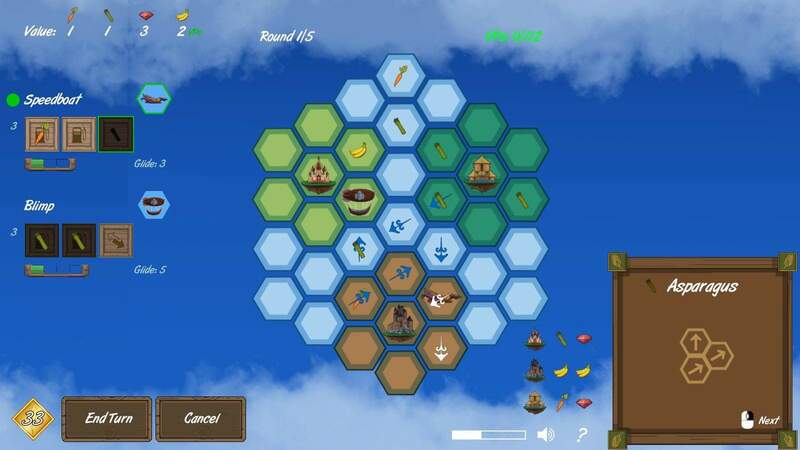 Classic mode features the more principled game mechanics and while it isn't bad to play a breezy mode game in classical style, it can be horrible to play a classical game in the more specialized breezy mode style. If you like to get ship upgrades and buy them, because you are used to get them, you´re making the first mistake, but port movement is the most important difference. It is always good to enter ports on breezy mode, but you never want to do it on classic mode, because you need fuel to get out of it. Only do it, if you have a powerful selling transaction to perform. In the coloured area around the cities you don't like to use wind patterns. Generally you should use fuel to enter ports from nearby squares. Playing a wind pattern on two or more ships is different of course and you should use it to enter ports, too. Refueling at cities is important and you have to use it very often. 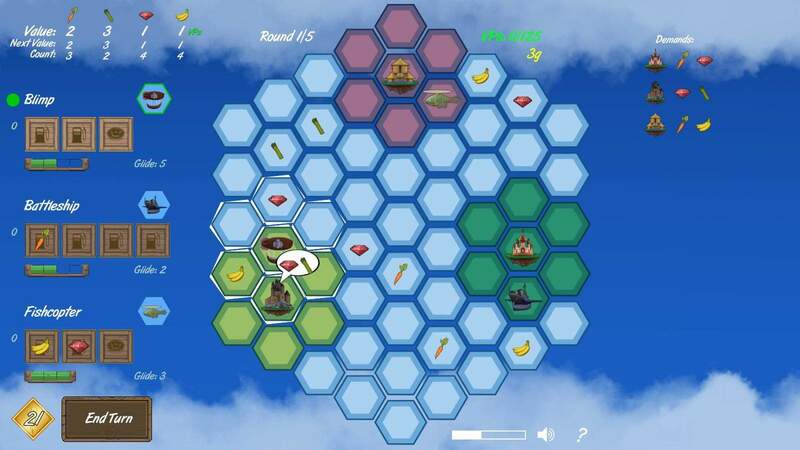 The start of a classical game is especially important, as the map is bigger and your ships will be positioned outside. You have to centralize them as quickly as possible. At least find the best meeting position for two of them. They can move together in the direction of the third ship. I don't look at city demands anymore, if I start a classic game. I only do it, after I have centralized my ships and have spawned some goods. Where will we go now? Dropping goods that another ship can take is something that you should always consider in these situations, too. But be careful as the game remembers, if these goods had been in used holds. At the start of the game on one square nearby your ships nearly always is a good. Using fuel on the first move won't cost you wind meter points, so it´s often good to start with that move, allthough I might decide otherwise, if that leads outside. Always control the center.